CHICAGO (WLS) -- Police are looking for two men wanted in a string of armed robberies on Chicago's West Side. Authorities said two suspects robbed four victims at gunpoint and took their cash, credit cards and cell phones. The two men were seen traveling in a dark-colored van. One victim was robbed in the 300-block of South Sacramento Boulevard around12:30 on Jan. 12. A second victim was robbed in the 500-block of North Avers Avenue around 7:30 p.m. on Jan. 15. 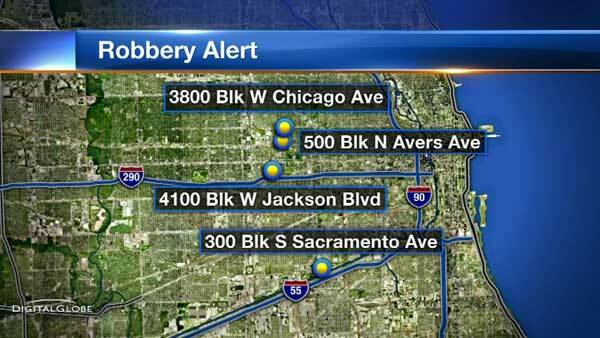 A third victim was robbed in the 3800-block of West Chicago Avenue around 9:15 p.m. on Jan. 30. The most recent victim was robbed in the 4100-block of West Jackson Boulevard around 11 p.m. in Feb. 3. Police said one of the suspects is described as an African American man in his late teens or early 20s, about 5 ft. 6 in. tall with a dark complexion. The other suspect is in his late 20s with a medium complexion. Anyone with information on these robberies should contact Area North detectives at (312) 744-8263.